Line a muffin tin with paper liners and set aside. Roughly chop chocolate and add to a heatproof bowl. Set over a pot with simmering water and melt while stirring. Let melted chocolate slightly cool down, then transfer to a piping bag. Cut off the tip and fill some melted chocolate into the muffin tin until the bottom of each tin is covered. Freeze for approx. 15 min. Add creamy peanut butter, butter, confectioner’s sugar, and salt to a bowl and whisk to combine. Transfer to a second piping bag with a wide tip. 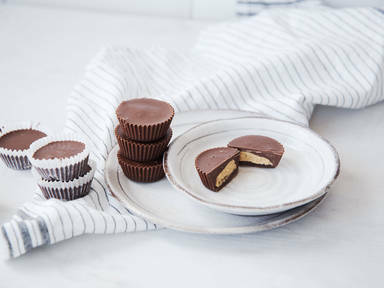 Remove muffin tin from freezer and pipe some peanut butter mixture onto the center of each chocolate cup. Make sure to leave some space around the edges. Fill each cup with remaining melted chocolate until the peanut butter mixture is covered. Freeze for another 15 min. or until solid. Enjoy!